I will guide you through stropping your small v-tools and gouges. 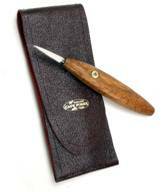 We offer any of our carving knives without a handle, completely sharpened and ready to go for your own custom handle. The Cutting Edge will now be available on line...I have been e-mailing it directly to you for years, but with all the Spam filters and new programs I found that you were not receiving it or it would come completely jumbled. I will send along an e-mail with a link when the newest version is available and I will also announce it on Face Book. Let us know how we can make it better... Keep in mind my real job is making the knives..
E-mail Karyn with your answers and if you have 2 correct you will be eligible to win.. Good Luck….remember please only enter once… The winner and answers will be announced on the web-site & Face Book at the end of February. It will be a great way to stay current on our move. I will also let everyone know via face book when the latest issue of “The Cutting Edge” is available at the web-site. $2.00 off admission Coupon Available. Send me an e-mail and I’ll send you the coupon as a pdf attachment. Your anniversary knife arrived, in great shape, yesterday. It's fabulous and so natural and comfortable in my hand that it feels like it's a part of me. Congratulations to you and your father on this joyous occasion of being successful, both with your business and your chosen endeavors together.